All you need is 5 ingredients for this easy no-bake Chocolate Salami dessert. This Italian chocolate dessert sausage is made with melted chocolate, vanilla tea biscuits, pistachios, and of course butter and heavy cream to hold it together. Looking for more easy no-bake desserts? Try our chocolate caramel pretzel bars or fruit and nut chocolate bark. This recipe was originally posted on Nov 10, 2017, we’ve tweaked it a bit since then. Everyone has their own version of this classic Italian dessert. I personally like to keep it simple. 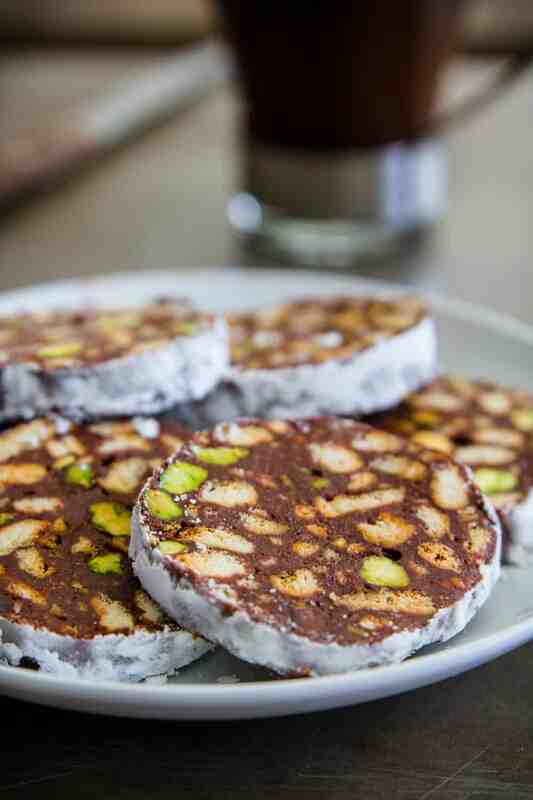 If you like more variety in your chocolate salami, by all means, add a few different nuts. The texture of the smooth ganache combined with the crunchy biscuits and pistachios are a true delight worth splurging on. 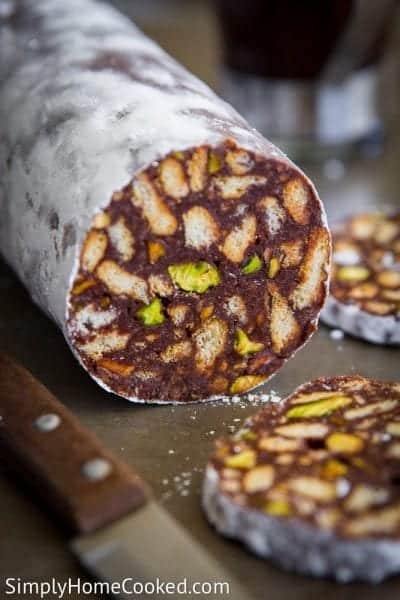 Although this chocolate salami dessert is Italian, my Bulgarian/Ukrainian family used to make this all the time. Obviously, every region and ethnicity has their way of making chocolate salami. This happens to be our favorite way of making it. I hope it becomes your favorite as well! Do you love no-bake desserts? Give these a try! fruit and nut chocolate bark. Make the ganache by combining chocolate chips with hot heavy cream and unsalted butter. Then using a spatula stir until smooth. Now mix the ganache, crushed tea biscuits, and chopped pistachios. Mix thoroughly to ensure that all the ingredients are evenly distributed. Place the chocolate sausage mixture onto a sheet of plastic wrap and roll it up tightly into the shape of a sausage. Then tie both ends and refrigerate for about 4 hours until solid. Chocolate salami is a well known Portuguese/Italian no-bake dessert consisting of cocoa, broken biscuits, butter, and sometimes nuts. These ingredients are melted into the chocolate and rolled into a sausage shape to replicate the look of salami. Some folks like to dust it with powdered sugar as well. How to store chocolate salami? Keep the chocolate salami in an airtight container in the refrigerator for up to 2 weeks. Or you can keep it frozen if you prefer to store it longer. Can I freeze chocolate salami? If you want to freeze chocolate salami, wrap it tightly in plastic wrap. Then wrap it once more with foil. Keep frozen for up to 1 month. This no-bake Italian chocolate salami is made with only 5 ingredients and tastes as if you spent hours making such a delicious dessert. In a large plastic bag, beat the vanilla biscuits into small pieces using a rolling pin. Heat the heavy cream in a saucepan or microwave so that it comes to a simmer (not a boil). Place the chocolate chips in a large bowl and pour the hot cream over the chocolate chips. Cut the butter into small cubes and place it into the bowl. Wait a few minutes and begin to stir the chocolate. You may need to reheat the chocolate in the microwave a few more times. If so, heat in 20 second intervals. You don't want to overheat the chocolate. Once the chocolate is a smooth silky consistency, add the crushed biscuits and chopped pecans. Stir to combine. Place a large piece of plastic wrap onto a flat surface and pour the chocolate mixture on top. 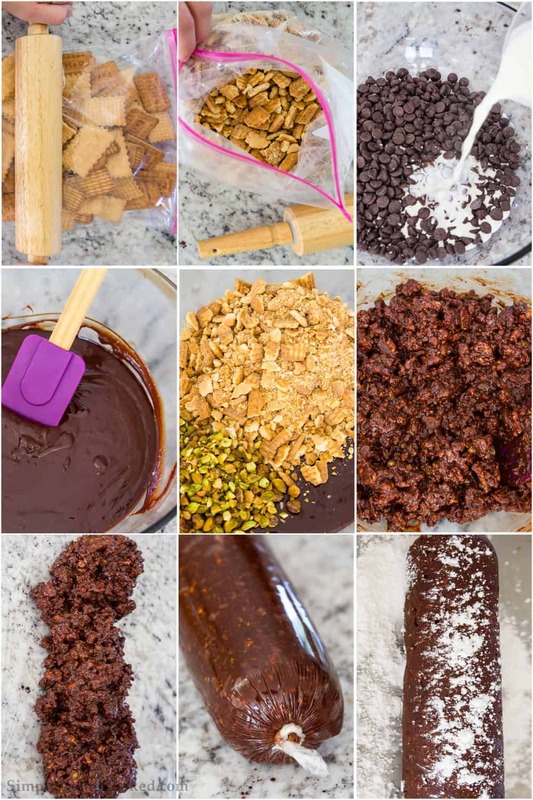 Roll the plastic tightly around the chocolate mixture so that it resembles a stick of salami. You can wrap a second piece of plastic wrap over the chocolate salami if you want to make it more secure. Finish off by tying both of the ends. Refrigerate for at least 4 hours. Once the time has passed, remove the plastic wrap and coat the chocolate salami in powder sugar. This recipe was originally published on Nov 10, 2017 it has been updated since. You can also use condensed milk instead of heavy cream, cocoa powder instead of chocolate and marmalade instead of pistachios. Highly recommend! Thank you for the fantastic recipe…can it stay without refrigeration? And how how many days? Thank you Benaiifer, Its best to keep it in an airtight container in the refrigerator, but you can keep it in a cool dry place as well. The shelf life will only last a few days at room temperature as apposed to a week in the refrigerator. Thank you for such a Fantastic recipe….what’s the shelf life of this?And can it stay without refrigerating? My mom made this over the holidays and I believe that I enjoyed it even more than my children! I liked the pistachios as opposed to other nut variations and I loved the fact that it tasted more “dark chocolate” than milk chocolate. It was a real treat. Thank you! 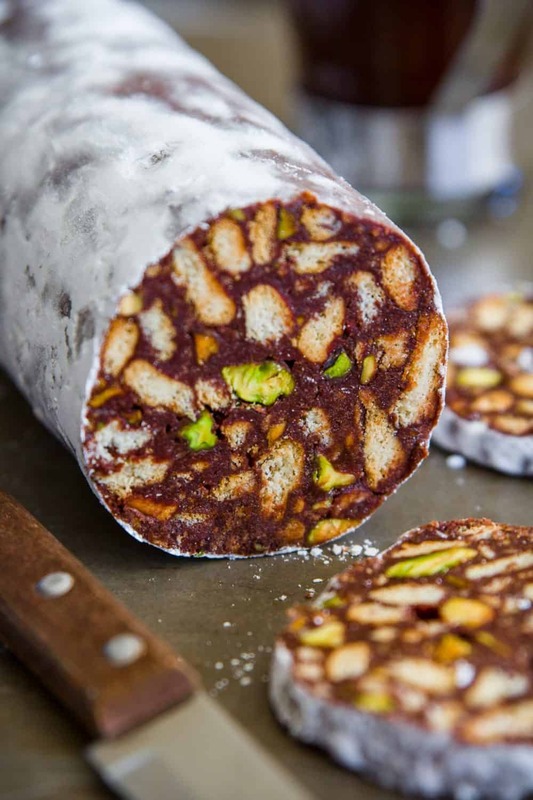 kids love this chocolate salami. So this looks like a dessert I would attempt. What brand tea biscuits did you buy? Hi Anna, I used Kedem brand for this recipe. Love it! My kid’s are obsessed with this chocolate salami. Beautiful pictures Dina! Thank you for this recipe! I will have to try it! Looks really yummy!